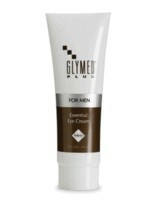 One of the premier anti-aging creams on the market for the male crowd, the Glymed Plus for Men Essential Eye Cream has a host of benefits for keeping that skin around the eyes looking and feeling youthful. It practically eliminates those unsightly dark circles around the eyes, and drastically reduces the lines that come with stress, age and too much sun. Men who suffer from puffy skin and bags under their eyes will really appreciate this cream; because it significantly reduces them and gets rid of the perpetually tired look they give a man’s face. Although the consistency of the Glymed Plus For Men Essential Eye Cream is much lighter than comparable brands, it is even more powerful and effective because of the blend of ingredients. Antioxidants and age-defying vitamins such as vitamin E and vitamin A are mixed with natural emollients that soften and soothe the skin. Macadamia Oil, Sunflower, Jojoba and Shea Butter are also a part of the mixture, and they all work together to enhance the natural moisture of the skin with their capacity to hydrate. The Glymed Plus For Men Essential Eye Cream is very straightforward to use, and correct application ensures the best results. Squeeze the bottle gently, measuring out just enough to cover a fingertip –preferably the index finger, to make sure it’s the right amount. Then lightly apply the cream to the region around the eye, smoothing it into the skin until it’s absorbed. Twice daily usage is recommended – once in the morning and then again at night. As a supplementary product that enhances the positive effects of the cream, follow up with the Glymed Plus For Men Essential Moisturizer. Water (Aqua), Helianthus Annuus (Sunflower) Seed Oil, Simmondsia Chinensis (Jojoba) Seed Oil, Cetearyl Glucoside, Glyceryl Stearate, Macadamia Ternifolia (Macadamia) Seed Oil, Glycerin, Butyrospermum Parkii (Shea Butter), Tocopherol (Vitamin E), Caprylic Acid, Glycine, Retinyl Palmitate (Vitamin A), Xanthan Gum, Fragrance, Iodopropynyl Butylcarbamate.